Coming after PING for years making some very popular wedges, such as the iconic Eye2s with square grooves back in the 1980s, made the idea of the Glide series “taking wedge design to a new level” intriguing. The company sent a 54° and 58° Glide standard sole (more on soles later) so I was off to the range for comparison with the 52° wedge—bent to 54° and 56°–bent to 58° I had been using. Stopping first at the practice green for some pitching and chipping two of the wedge’s features came into play. The Glides have a ¾ inch longer grip which may not sound like much but in play that little bit more grip means you are able to go down on the shaft just that much more giving just that much more control of the height of shots. Later on the course over the 180 holes for this test, time and again it was very nice to know regardless of the shot required the Glide could provide the control needed. Taking them to the course, the first use was on the second hole, a medium length par-5, for my third shot of 55-yards from a grassy Bermuda lie to a raised green. The 58° Glide clipped the ball out and actually caused it to check which was certainly different than what I had experienced with my other wedges. Incidentally in case you’re thinking I had been playing beat up 20-year veterans, both of the “old” wedges the Glides replaced were from major manufacturers, one being less than two months old and the other about six months old. As that first round continued the comparison in performance was striking. I won’t go into a shot-by-shot description but the two Glides quickly had my confidence, a confidence that only grew over succeeding rounds. Spin, particularly on partial shots, using a Titleist Pro V1 or a Callaway Chrome Soft (ball tests are underway as well) was excellent and on full shots into Bermuda greens the ball often did the really unusual…it spun back. 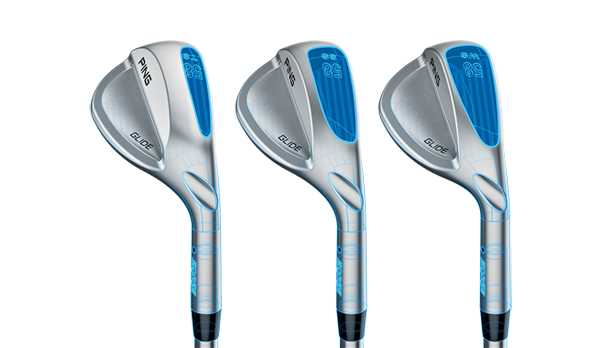 As note before, Glide wedges give a choice in sole widths. There’s a thin sole model for swings that produce shallow divots and for play on firm turf, a wide sole for swings making deep divots and when play is on softer turf and of course the standard width. 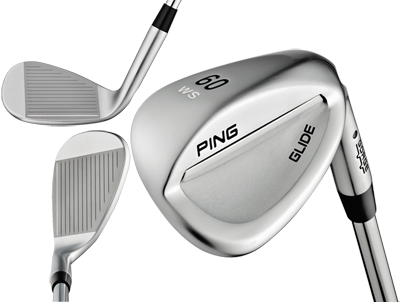 The name Glide comes from PING’s description of how they “glide” through the turf better than any other wedge presumably due to the very smooth, low friction sole and soft leading edge. The only major negative putting the Glides into play was getting used to the bounce of the 58° in comparison to my previous sand wedge which had a wider sole. 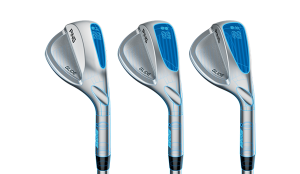 My recommendation: These are very good wedges and if the new season means new wedges you should evaluate the PING Glides. Retail price is $140 in steel and $160 graphite.